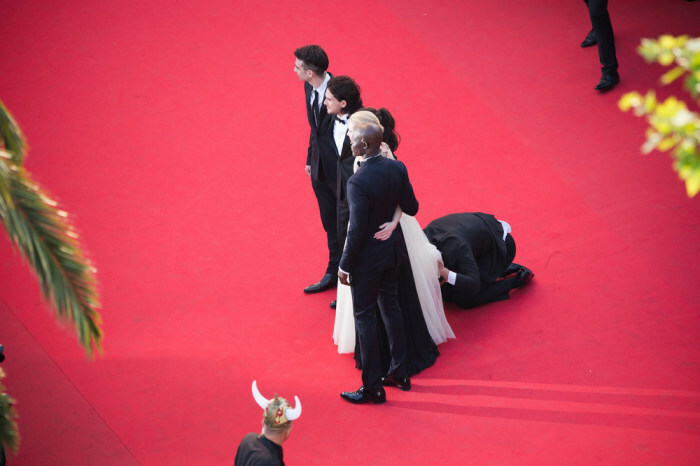 A man rushed onto the red carpet at the Cannes Film Festival and dove beneath actress America Ferrera's dress in a bizarre incident. A man ducks under America Ferrera's gown as she poses with fellow "How to Train Your Dragon 2" co-stars Jay Baruchel, Kit Harington, Cate Blanchett and Djimon Hounsou. Security officials quickly pulled him away Friday as the man tried to hide under Ferrera's voluminous dress before the premiere of "How to Train Your Dragon 2." "It's fine, I'm over it," Ferrera later told The Hollywood Reporter. She thanked her fellow cast members who were standing with her and quickly made sure she was all right. "They were all so supportive. They all just wanted to know I was okay," she told THR. The man was visible under her sheer overskirt until he was pulled away by security. British tabloid The Daily Mail reported that the man is Vitalii Sediuk, a Ukranian who has pulled such celebrity pranks before. Although TODAY was not able to confirm the man's identity, he clearly resembled past photos of Sediuk. In 2012, actor Will Smith slapped Sediuk when the man tried to kiss the actor on the lips at a Moscow event promoting "Men in Black III." "He's lucky I didn't sucker punch him," Smith said at the time. Sediuk also crashed the 2013 Grammy Awards, taking the stage as singer Adele walked up to receive an award, even speaking into the microphone to the confusion of presenter Jennifer Lopez. 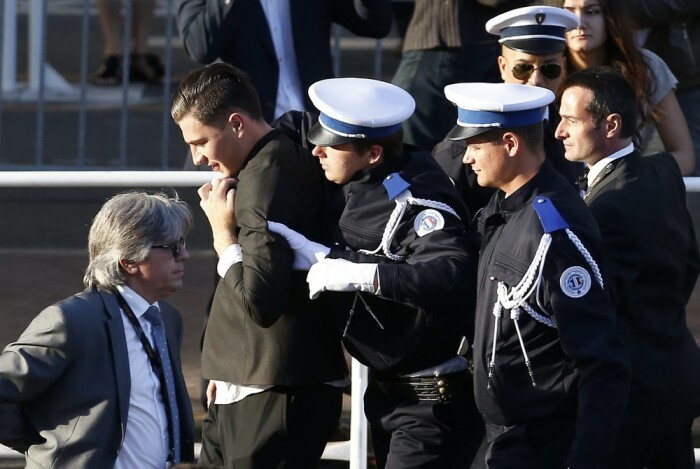 And in February, Sediuk was dragged off another red carpet, this time at the Santa Barbara International Film Festival, after lunging at actor Leonardo DiCaprio, grabbing him around the waist. He pulled the same move on actor Bradley Cooper at the SAG Awards in January. At Cannes on Friday, it was a surprising development on a red carpet renowned for its strict decorum. Festival organizers didn't immediately return messages to The Associated Press about the incident. Ferrera looks shaken up after the incident. Ferrera, the former star of TV's "Ugly Betty," was on her way into the Palais des Festivals for the world premiere of the DreamWorks animated sequel. Security guards quickly responded and took the man away.